Trolls Besides Facebook’s – Zero Equals Two! I’ll have to look into this one later on. 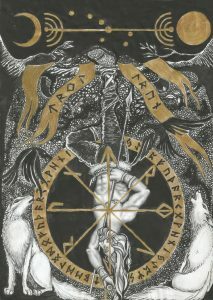 For a good analysis of the runes, check out Collin Cleary’s “Summoning The Gods”. The work as a whole was pretty mediocre and all-over-the-place, but the chapter on runes was very enlightening. Varg Vikernes‘ 2011 work “Religion And Sorcery In Ancient Scandinavia” (which also contains a large chapter on the runes) and his newer “Reflections on European Mythology And Polytheism” were also very comprehensive— if you’re able to separate the objective historical information therein from his tendency to interject his own opinions and speculations, which’s something he’s known for. Stay away from his terrible “Paganism Explained” series though. Stephen McNallen’s “Asatru: A Native European Spirituality” was also surprisingly good and delves a bit into rune rituals.